Goodwin-Greene Hut, Gold Hill to left. The Goodwin-Greene hut was built in the 1970s in memory of mountaineers Peter Goodwin and Carl Greene. 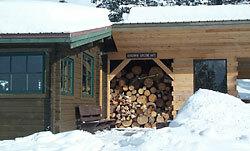 The hut was fully renovated in 2001. Layout and capacity: All Braun huts have propane burners for cooking, photovoltaic lighting, mattresses and pillows, eating and cooking utensils, toilet paper, matches, and cleaning supplies. Hut users melt snow for water. 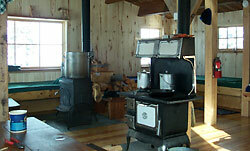 Goodwin-Greene hut is a one-level structure that sleeps 10 (3 doubles, 4 singles). NO DOGS! 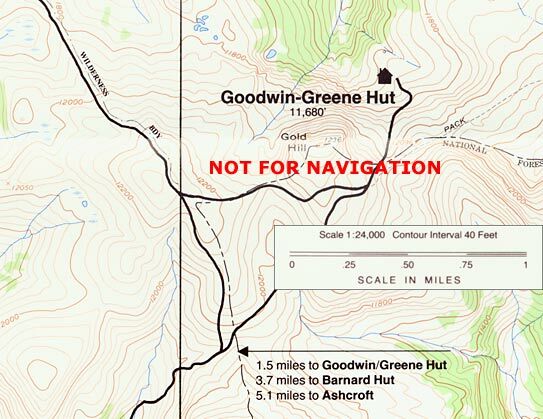 The Goodwin-Greene Hut is most commonly accessed by taking the Express Creek Road from Ashcroft to Taylor Pass and then roughly following the Richmond Ridge Road to the hut. This route is a beautiful ski up the Express Creek Valley and through the high alpine terrain at the end of Richmond Ridge but can be quite challenging. The ski up Express Creek Road crosses under many large avalanche paths and the last few miles over Richmond Ridge is all above treeline and offers few landmarks. During severe weather and whiteout conditions route finding can be next to impossible. The other common route into the Goodwin-Greene Hut is from the Barnard Hut. While this route doesn't have the same avalanche hazards as skiing in from Ashcroft, the route finding can be just as challenging.